For many folks, ballpoint pens are the epitome of boring but they are incredibly versatile and, if we are being honest, they are probably the most efficient choice for most office spaces. 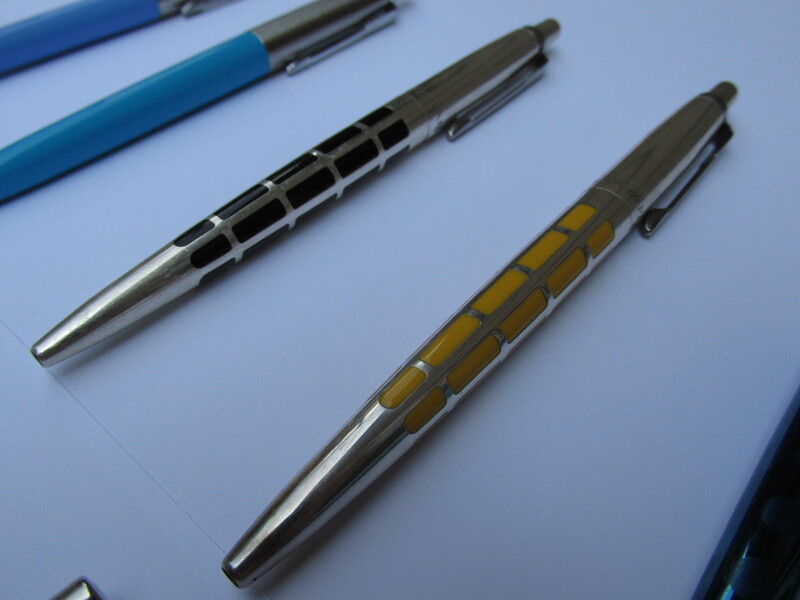 So, you mine as well use a ballpoint that is comfortable and easy on the eyes. 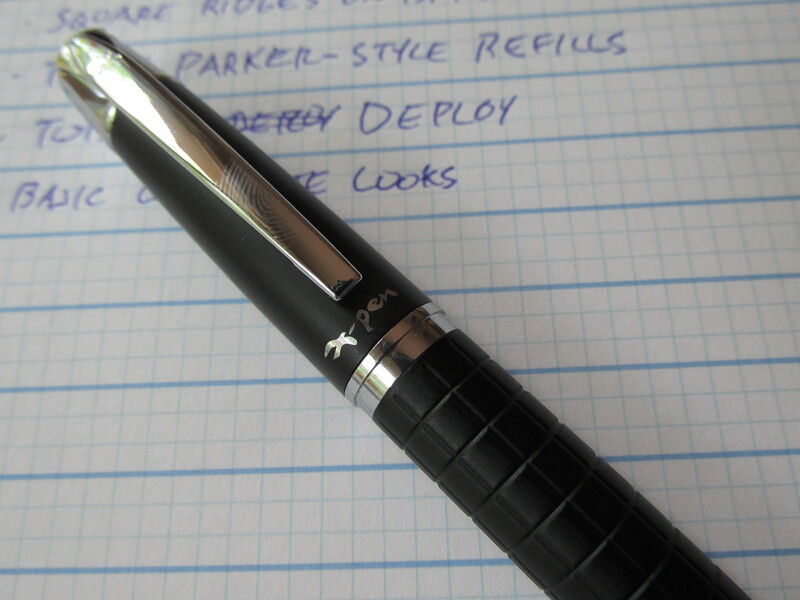 For me, the X-Pen is one of the most comfortable pens (ballpoint or otherwise) that I own. While it does have a certain “gift-box” ballpoint pen look, the design element that makes the pen so comfortable also adds a bit of design flair. 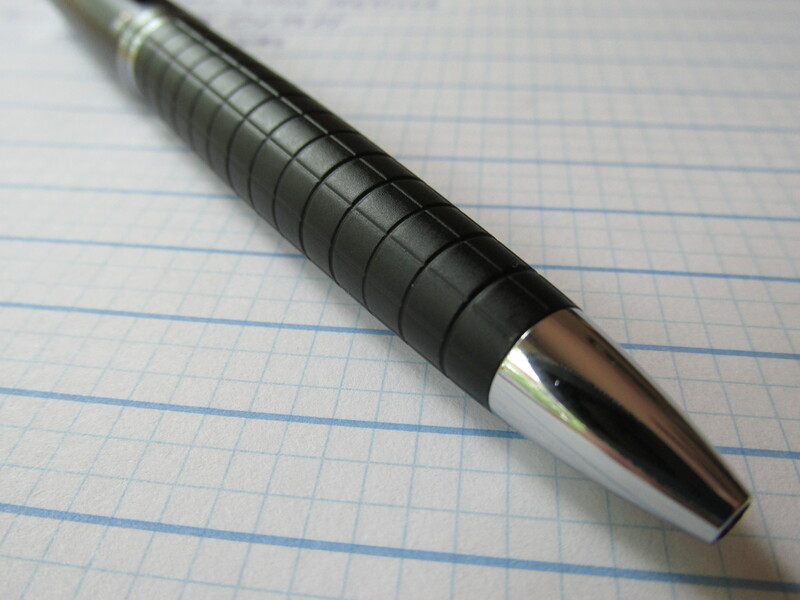 That design element is the graph-shaped ridges of the pen body. 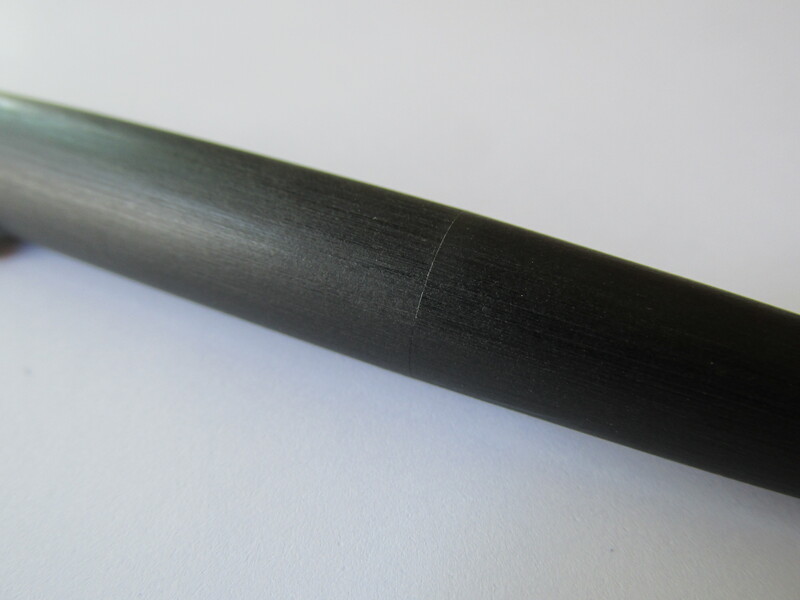 The combination of this pattern, the thick, tactile plastic of the body and the matte black finish of the upper portion result in a pen that is lies in the hand nicely. Also, the center of the pen body has a diameter of about 0.5 inches which is just about perfect for me. There are thin pens that make me feel like I need to grab tightly and there are fat pens that seem too unwieldy. This X-Pen hits the diameter sweet spot for me. 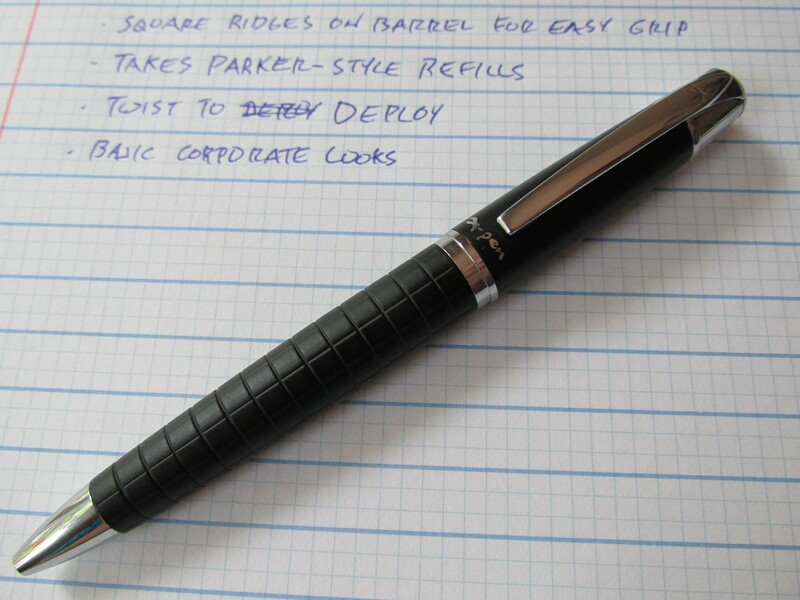 Retractable ballpoints deploy with either the snap of a button or a twist of the upper body. The X-Pen Master is a twister. I can’t lie – I prefer button action retractable pens but the twist mechanism built here is perfectly fine. There is the smallest hint of metal on metal rubbing in the twist action so it’s not the smoothest mechanism in the world. I also like the fact that the refill extends fairly far out of the hole when deployed. Refill tips that barely extend out of the hole are just the worst. The silver-colored trim works nicely with the matte black of the body. 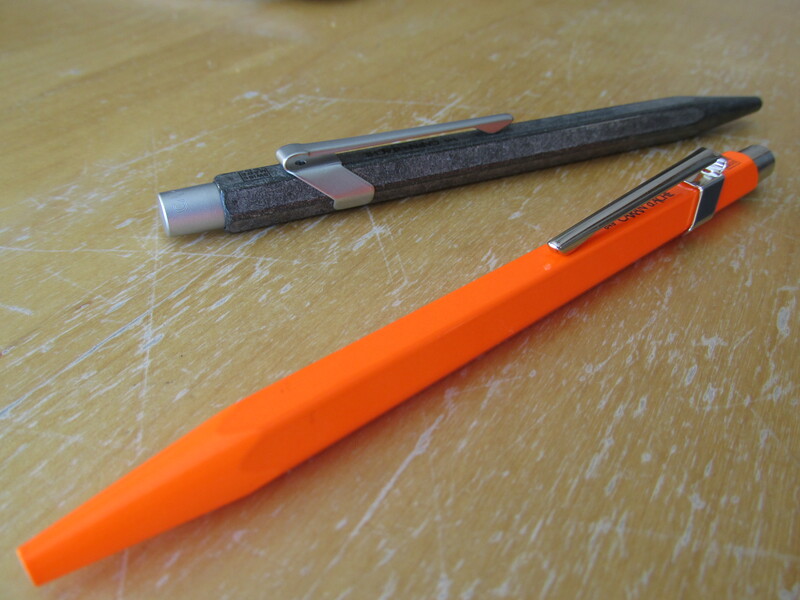 The width of the clip matches the overall size of the pen and there is a bit of depth to the clip design where it connects to the top of the pen. With respect to the clip and pen, there is one minor design feature that bothers me more than it should. The bottom of the clip does not evenly bisect the X-Pen logo printed near the middle of the pen. I really like that the logo has a handwritten look to it but the obsessive part of me wishes the clip lined up with the middle of the logo. Yes, I’m probably being overly fussy. 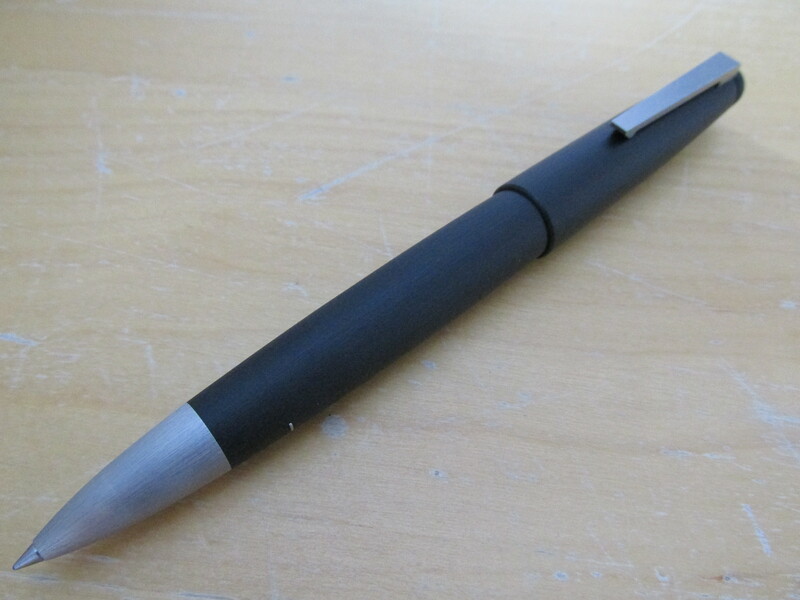 The X-Pen Master ballpoint goes for a reasonable $33 on their website. I paid a fair $25 for mine during a recent visit to a New York City pen store. In short, the X-Pen Master is a reasonably priced, comfortable ballpoint with enough design flair to be more than a run-of-the-mill gift box ballpoint pen. 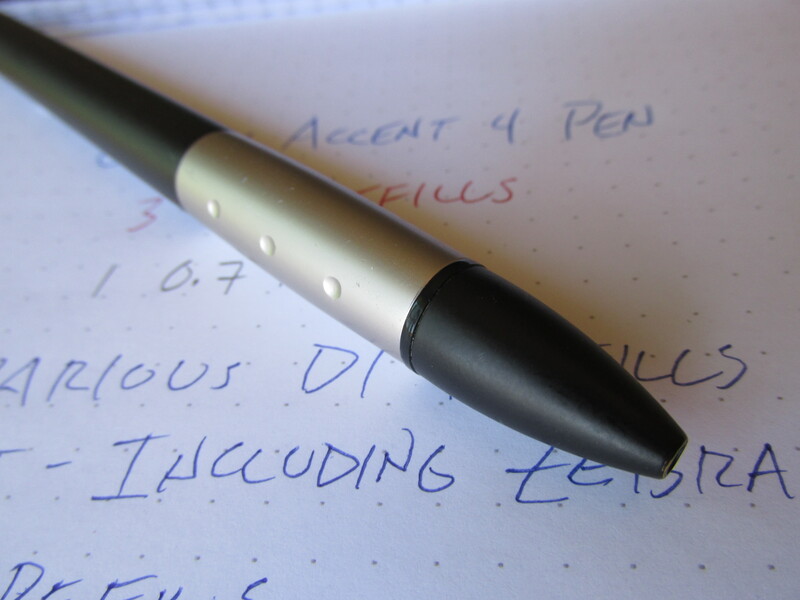 I reviewed the Lamy 2000 Multipen and it turned out to be the most popular post I’ve written in a while so it seems like a good time to review one of Lamy’s other multipens, the Accent 4Pen. You have to give the people what they want! I have owned the Accent for several years and it is a great pen. However, for two reasons that I’ll get to soon, it falls just a bit short for me. I really, really want to like this pen but these two issues keep holding me back. That’s not accurate. I do like this pen – quite a bit actually. I just don’t love it and I really, really want to love it. First, some good stuff. 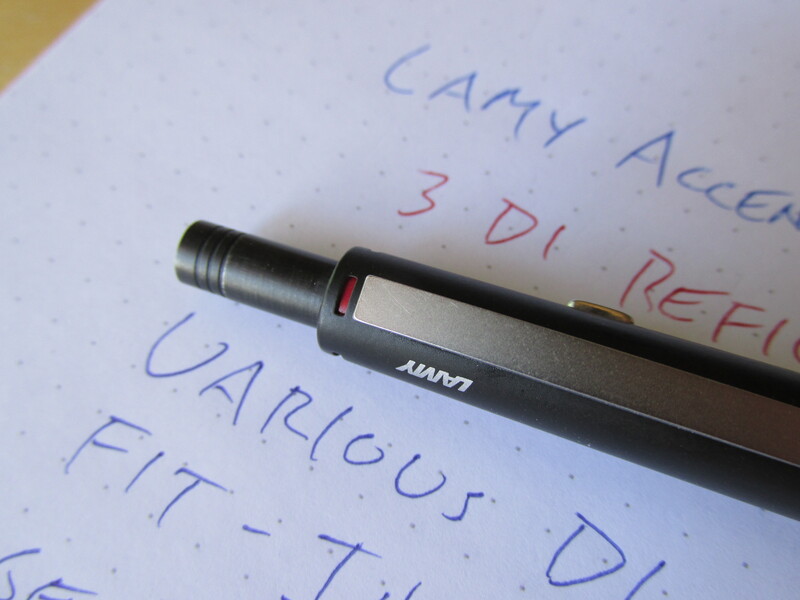 It’s a Lamy so the build quality and classic design are both aces. My Accent is about 8 years old and over these years of not infrequent use, it has performed like a champ. There are a few scuff marks on the matte black finish here and there but that is entirely expected. I did have to replace the mechanical pencil thingy but that was my fault. I forced a piece of graphite into the mechanism and jammed it. Lamy is pretty good about replacing broken bits on their products but the malfunction was my fault and I did not feel like waiting the 3-5 weeks or paying shipping for an inexpensive repair. I forked over about $9 and bought a replacement online. 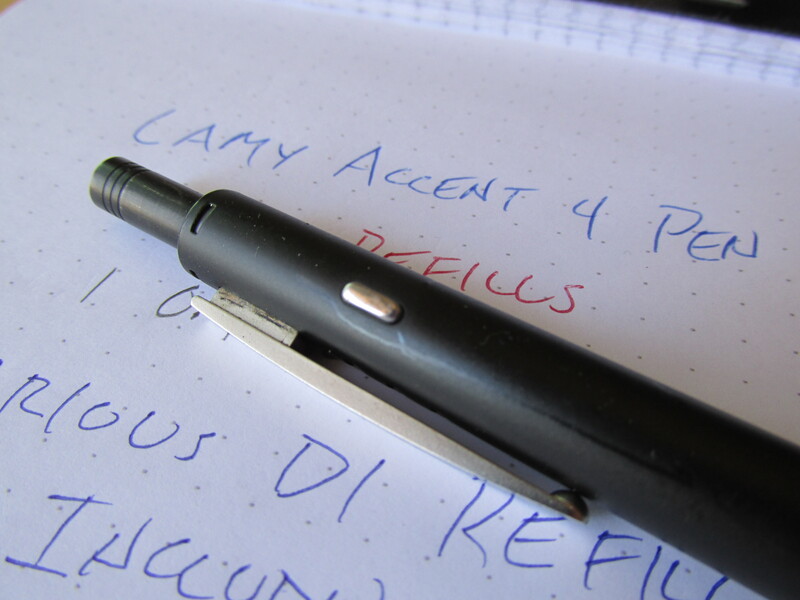 Compared to the Lamy 2000 Multi, the Accent 4Pen is a bit heavier. 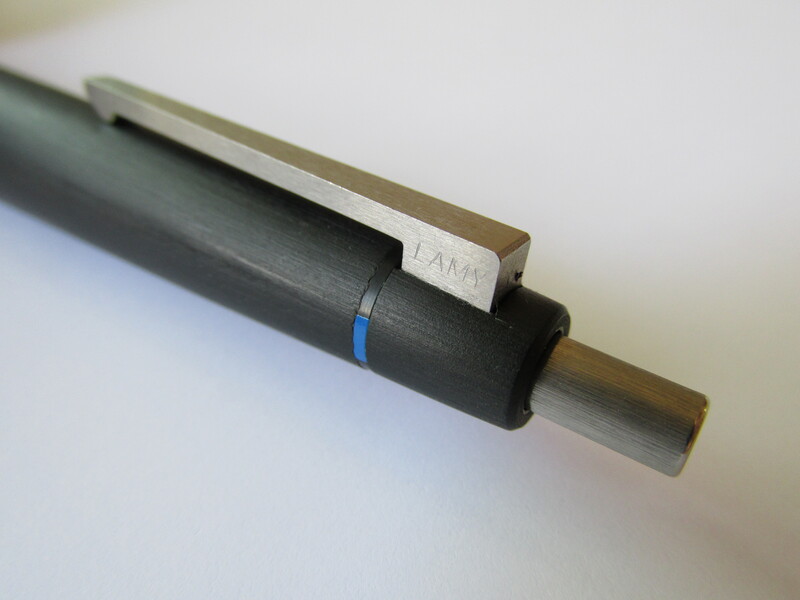 While the Lamy 2000 is evenly balanced with the center of mass located very close to the middle of the body, the Accent is weighted more towards to the point. I like this forward weighting quite a bit as I feel like I have good control when writing. Also, can’t we all agree that pens weighted noticeably past the half way point and away from the point are just the worst? Anyway, the clip on the Accent is spring loaded which is pretty cool. Even cooler is the fact that the clip is rock solid showing essentially zero unwanted wiggle. 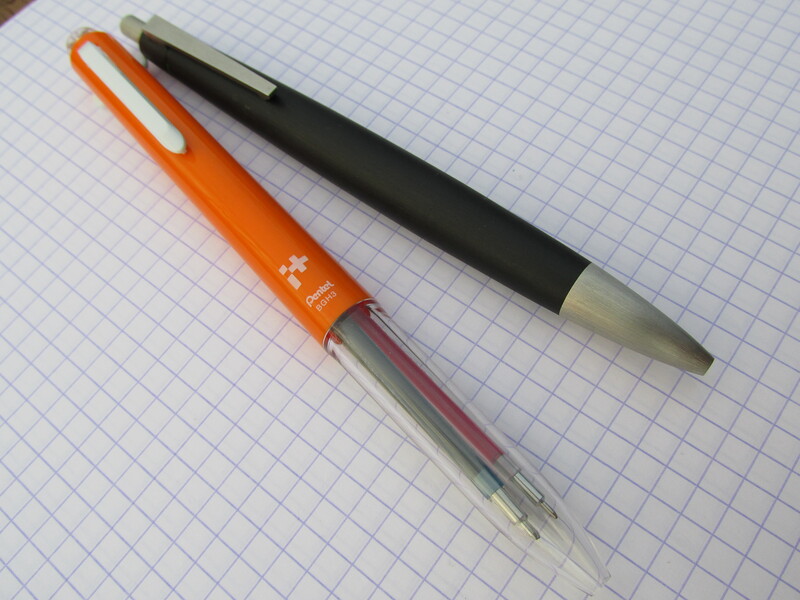 As for refills, the Accent 4Pen takes three D1 refills and a 0.7 mm mechanical pencil. There’s a lot to like with a 3 + 1 set up. It offers plenty of pen variety with the added benefit of having a pencil. The Lamy D1 ballpoint refills are some of the best around and they fit perfectly through the tip of the pen resulting is zero refill wiggle. 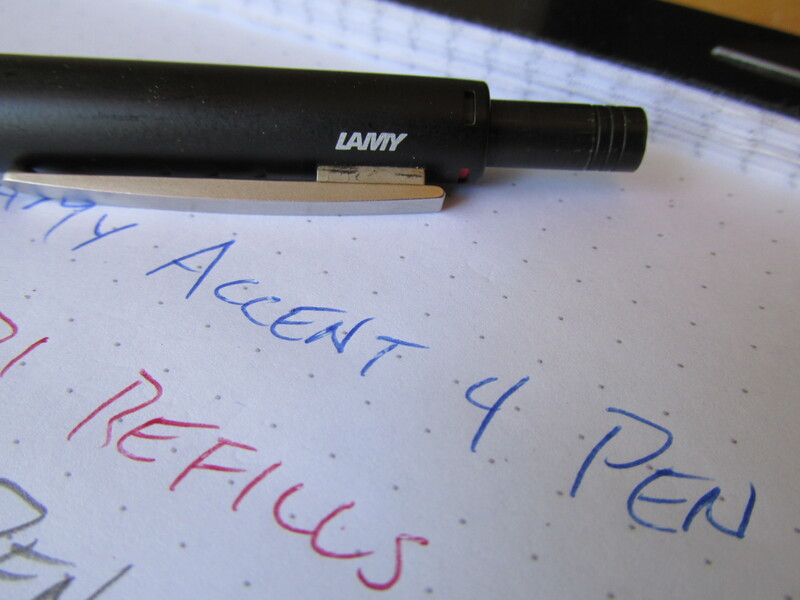 Whether it is the 2000 or the Accent, Lamy refills feel as rock solid as any single refill retractable pen I have tried. That said, the refill hole of the Accent is a bit wider than the one on the 2000 so I do notice a bit of wiggle when the former was loaded with a slightly thinner D1 Zebra gel refill. (I do not recall coming across a wiggly refill, Lamy or otherwise, for the 2000 yet.) The mechanical pencil in the Accent is great. 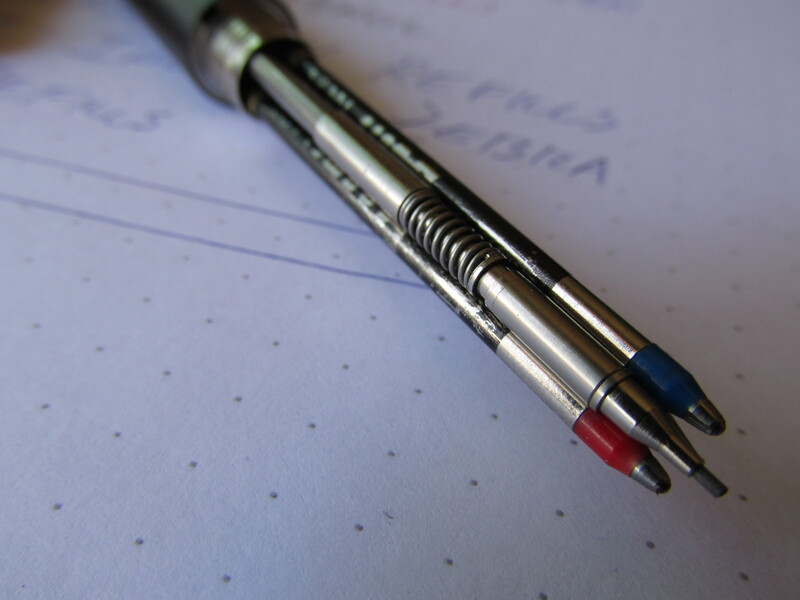 Like any pencil portion of a multipen, you are limited regarding the number of graphite pieces you store onboard but the pencil of the Accent is one of my favorites mechanical pencils. There is just something about the line of sight I have on the graphite and the way the hole, pencil collar and graphite line up that works really well for me. One key difference between the Accent and the 2000 is the retraction method. The 2000 uses the same button to deploy and retract all of the refills. The Accent uses one button to deploy the refills and a second button on the side to retract the refills. I do prefer the one button approach but maybe the two button set up is needed because of the mechanical pencil. Importantly, the retraction button is easy to depress without being so soft that you can suffer an accidental retraction (that sounds really bad). So far so good, right? So why does the Accent fall just a bit short for me? For starters, let’s talk about the grip section. 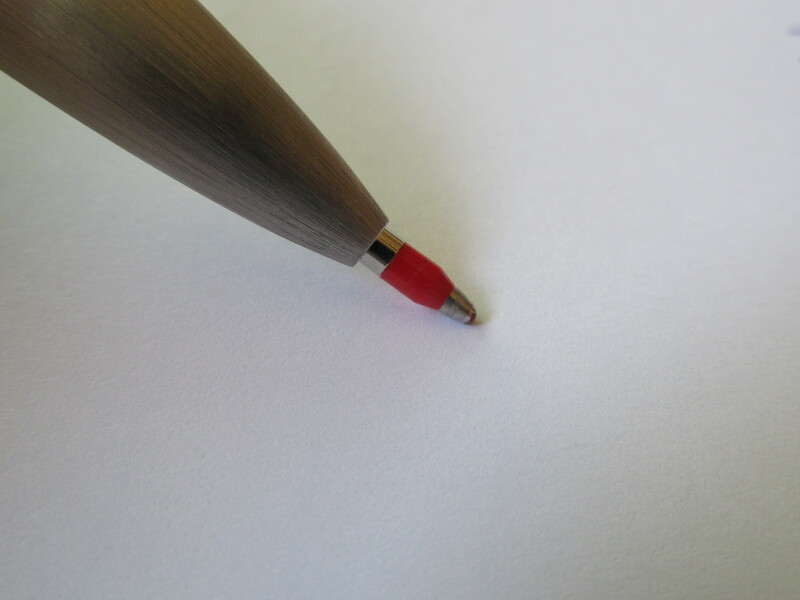 If you look at the contours of the pen, you see that the widest part of the pen is the grip section. The width is not really my problem. My problem is that the grip section is pretty darn hard and gets uncomfortable after a few minutes of use. It is actually more complicated than that though. 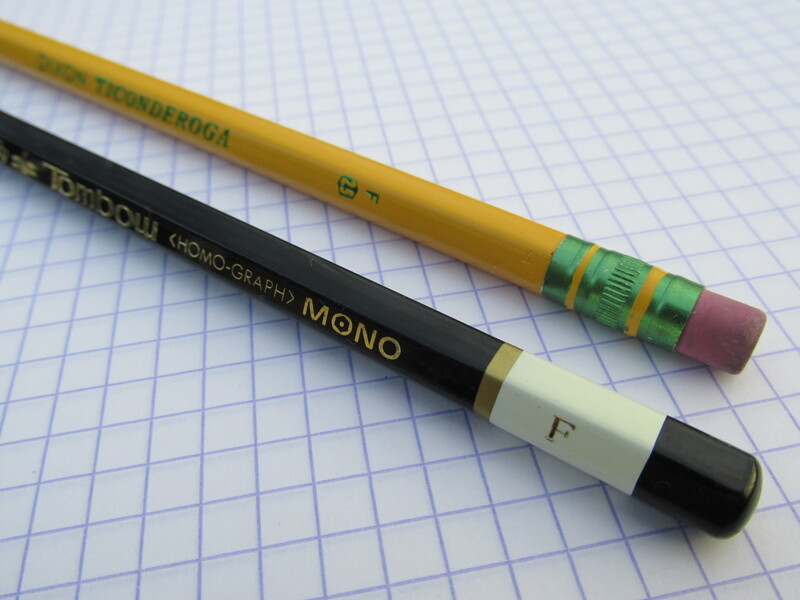 The pen refills do not stick out of the hole as far as the pencil collar and graphite. So, when using a pen refill my natural grip is right on the thickest and hardest part of that grip section. 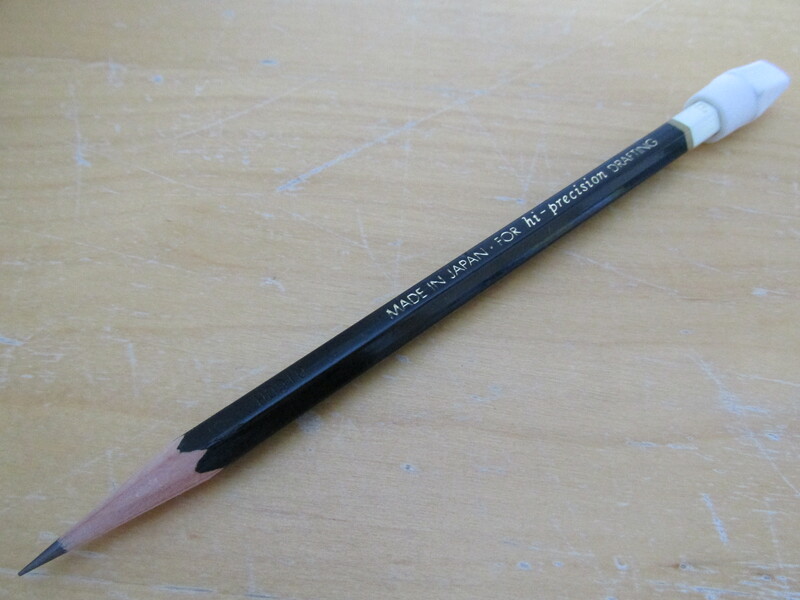 However, when I use the pencil, my natural grip falls a bit lower and I end up holding the very top of the black tip section which is actually rather comfortable. So, I end up with a comfortable grip when using the pencil but a hard and uncomfortable grip when using a pen giving the whole thing a rather schizoid experience. My other issue with the Accent is really nitpicking. Take a look at the picture below. Do you see what color indicator is located above the clip? Yup, it’s the red indicator. Really Lamy?! Why would you put the color most people use the least in the “home” position of a multipen? That’s just stupid! Unfortunately, the color indicators cannot be moved. Yes, I could put whatever refill I want in that position but do I really need to take a Stroop test when using a pen. Anyway, I’m not giving up on the Accent just yet. 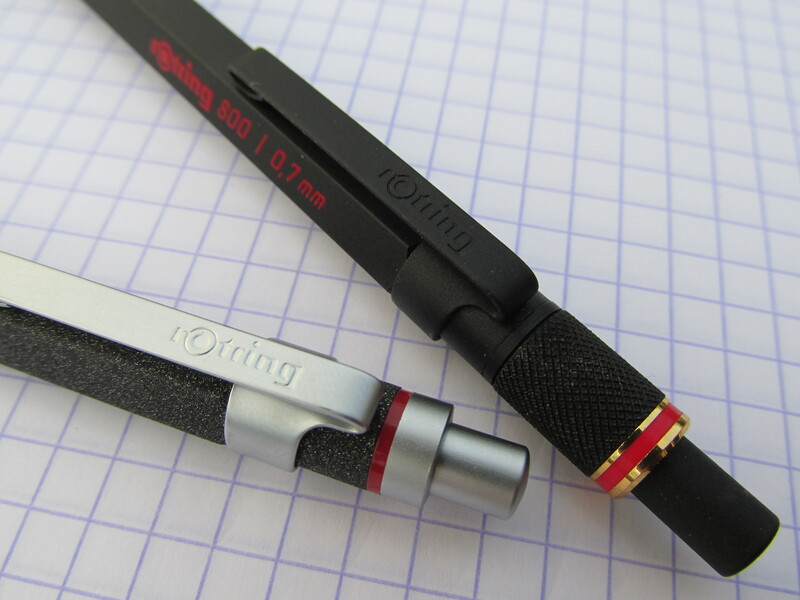 There is another version with a Palladium finish and a rubber grip section. If that rubber grip is more comfortable, and how could it not be, then I can learn to deal with the bizarre set up of the color indicators (Seriously Lamy, what the %$#@ were you thinking?!). The Accent 4Pen goes for about $75 which certainly is not cheap but given the materials and the build quality, it’s a reasonable sum. Should I find a good deal on the Palladium version someday then there is enough to like about the overall style and build quality to give the Accent 4Pen a second chance to become That One Pen. Let us start this review with its conclusion – if you want/need to own a ballpoint multipen, the Lamy 2000 multi is the way to go. I have a handful of multi-pens, including the Lamy 4-pen, but none of them deliver multipen benefits while minimizing multipen compromises as nicely as the Lamy 2000. 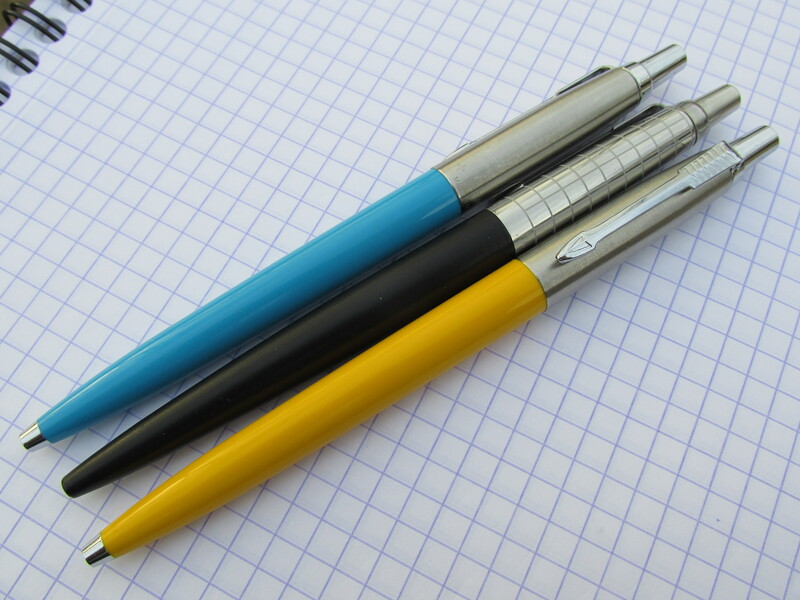 The benefits of multipens are obvious – multiple colors conveniently located in one pen body. Everyone’s multipen use cases will be different. For me, I find it helpful to have more colors in one pen body while tutoring individual students. Getting efficient at switching colors on the fly can take a bit of practice, but with a bit of memorization and practice you should be able to switch colors without looking. For the Lamy 2000, I know that the clip represents the black refill, a 1/4 turn from the clip and away from me (I’m a lefty) is the blue refill, 180 degrees from the clip is the red refill and 1/4 turn towards me is the green refill. 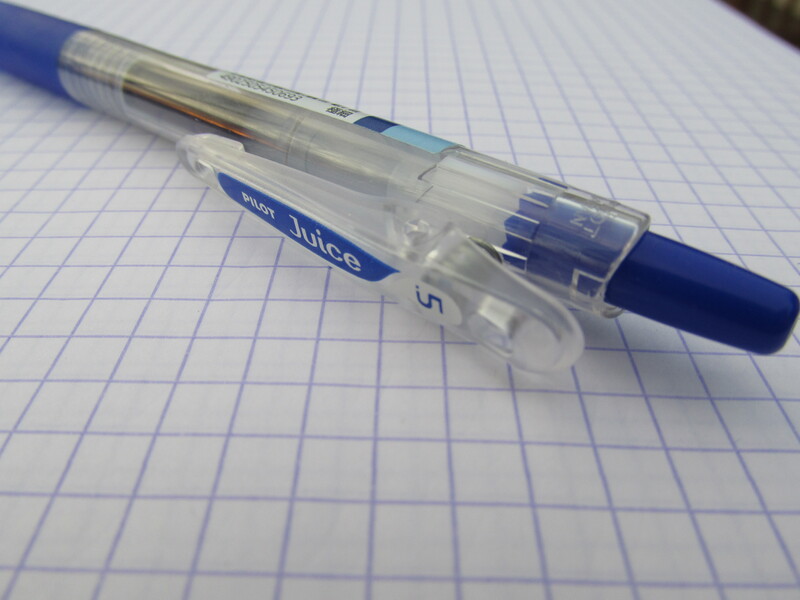 Some multipens rely on dedicated sliders for each refill. 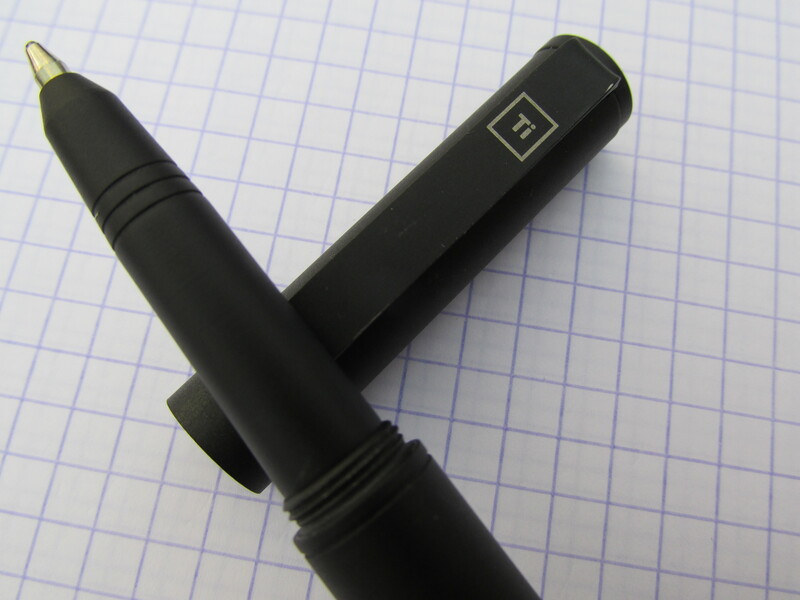 Others, like the Lamy 2000, rely on one button, a gravity-based swapping mechanism inside and color indicators on the body. The former of these systems will use long, thin refills while the latter of these systems use D1 type refills. Personally. I much prefer the one-button-gravity approach as it (a) allows for a more refined looking pen, (b) seems to allow the pen body to have a thinner diameter and, perhaps most importantly, (c) does not tie you to proprietary refills. Before elaborating on point (c), let me come back to point (b) a bit more. I don’t know what it is about fat multipens but I just do not like them. I enjoy a big ‘ol fountain pen as much as the next person. 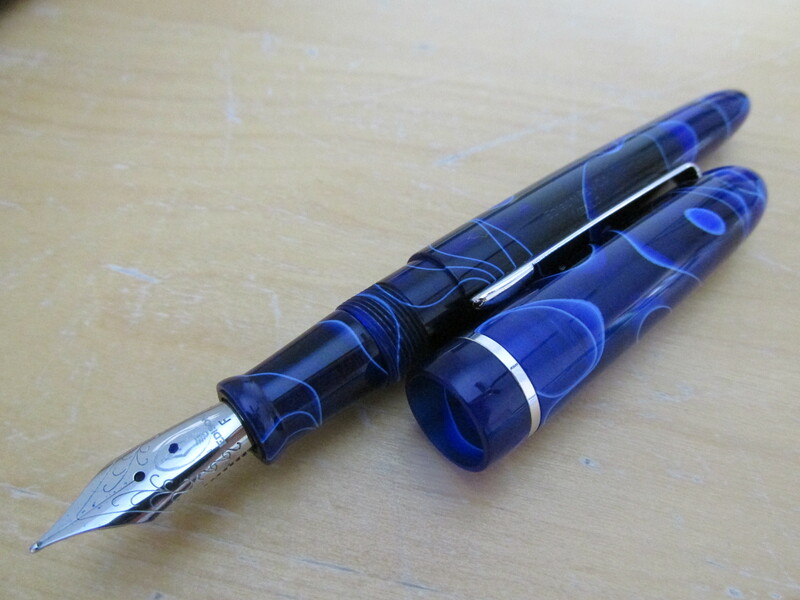 When it comes to ballpoints and other non-fountain pen types, I much prefer no-so-fat designs. 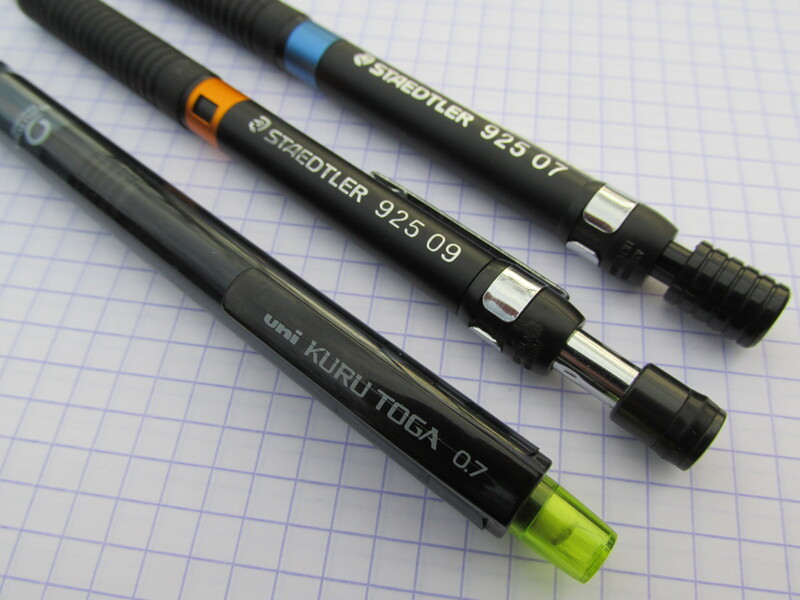 Back to issues associated with multipen refills. I am glad to be proven wrong, but I do not know of any slider-type multiple pen refills from one brand that work in the pen body of another. Even if there are such instances, the amount of cross over with slider-type refills will be minimal compared to the variety of brands and inks available in D1 refills (here is the page from Cult Pens showing various D1 options). That brings up another factor. 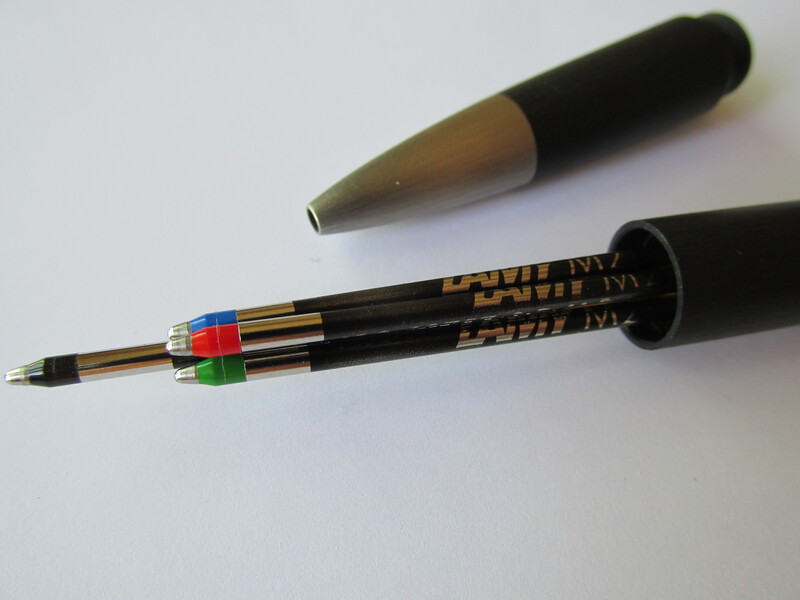 With single-button gravity systems that use D1 refills, your multipen is not limited to being just a ballpoint or just a gel pen. The same D1-based multipen can hold your preferred ballpoint refill (or two) along with a gel option or two. With this kind of flexibility, I may yet find a combination that turns a multipen like the Lamy 2000 into “That ONE Pen”. Can I just get away with saying the pen is German and be done with the build quality part of the review? 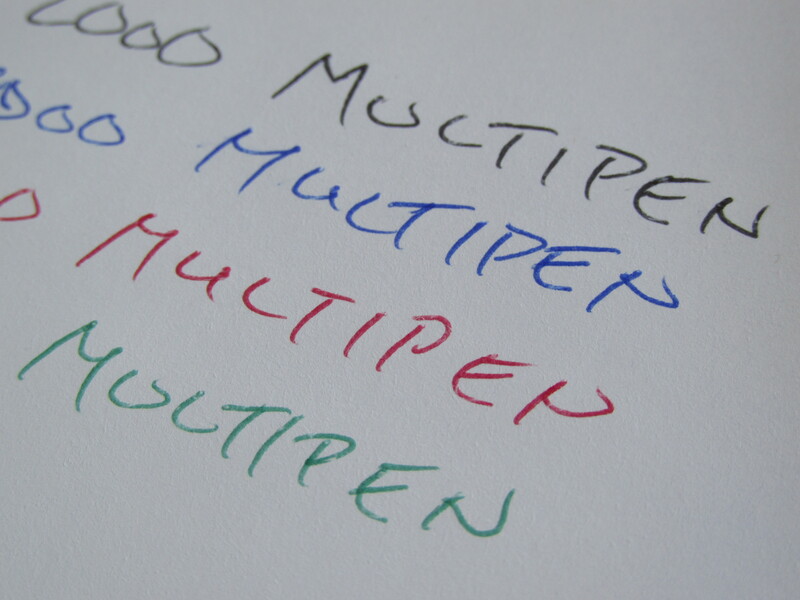 Maybe not, but like all of Lamy’s products, the 2000 Multipen is well made. The button mechanism has just the right amount of tension and I can correctly deploy the color I want 95% of the time without looking. (I just went 19 for 20 on a random and rapid refill selection test.) 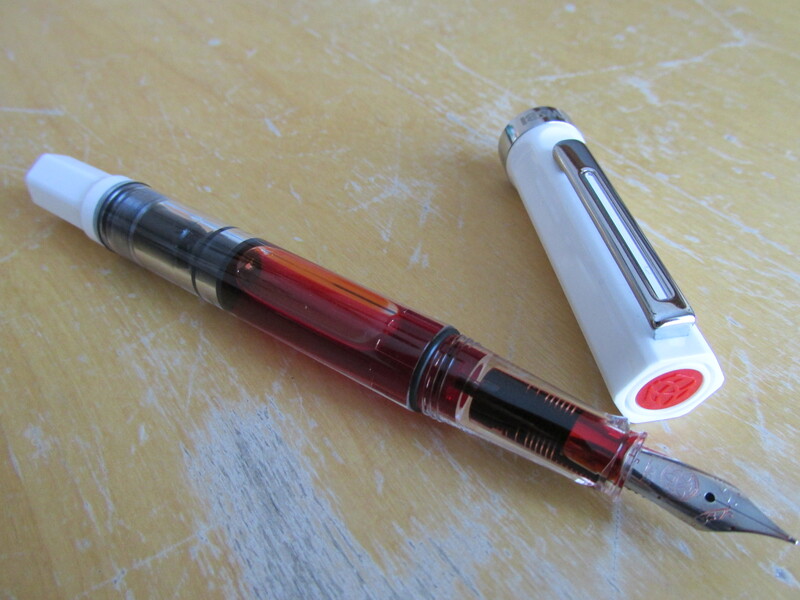 There is some mechanical rattle when you twirl the pen around that completely goes away once you deploy a refill. I have yet to met a multipen that is 100% quiet 100% of the time so I would not mark the 2000 down for this issue. Besides, the rattle provides a nice bit of white noise when twirling the pen and thinking. One (minor) negative point – there is a small amount of left/right wiggle to the clip. 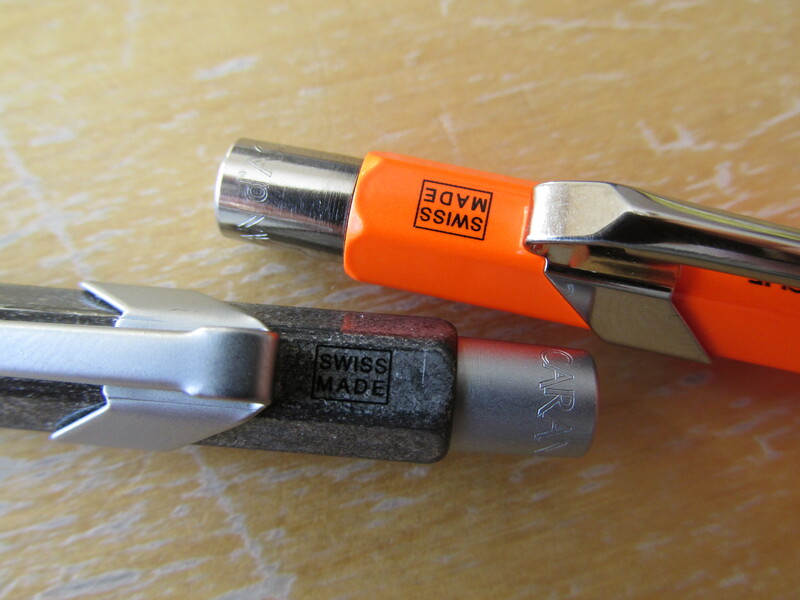 Clips on all Lamy 2000 pens (fountain, roller, ballpoint, multi) have a hinge that allows the bottom of the clip to move away from the body. This feature is helpful when securing the pen to thicker material like the front pocket of your jeans but it leads to a bit of clip wiggle perpendicular to the body of the pen. Back to the positives. As is true for the entire Lamy 2000 line of pens, the black fiberglass (aka Makrolon) body is lightweight, sturdy and tactile. It may pick up a scratch or two here and there but those marks just make the pen yours. 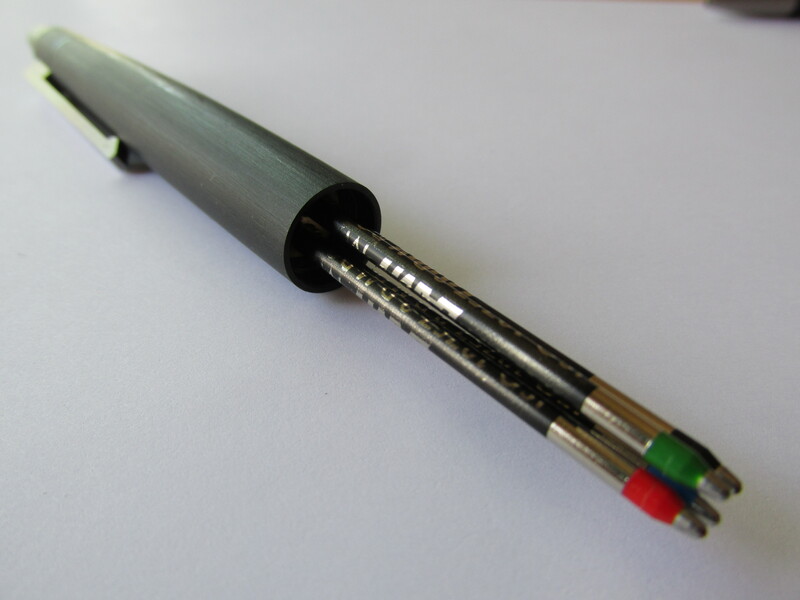 Lastly, in terms of build quality and design, the body of the pen is actually two pieces. However, the seam that separates the grip area piece from the rest of the pen is barely noticeable. 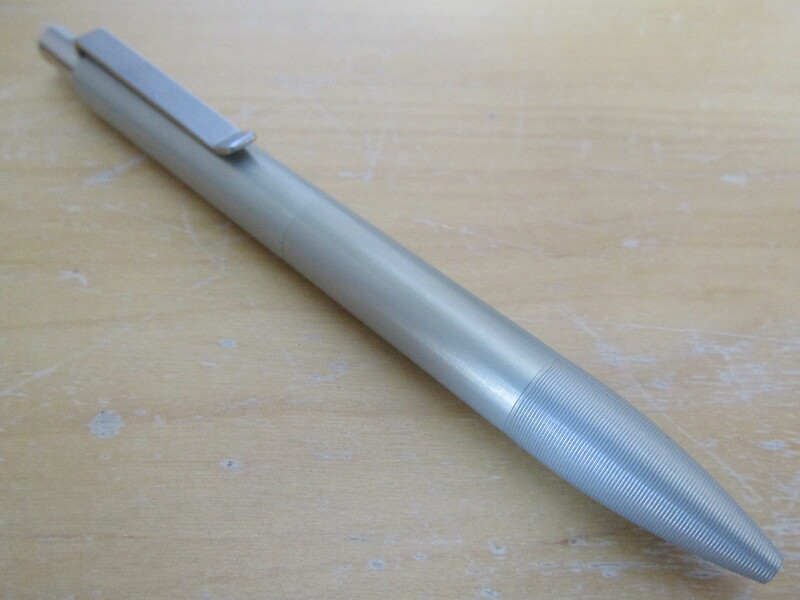 The pen looks and feels like one piece of fiberglass. The Lamy 2000 ballpoint D1 refills are among the best D1 refills I have used. Save for the green, all the colors are reasonably vibrate for ballpoint inks and each refill gives a smooth but not slippery ride. Somebody should investigate the science behind this issue, but I have yet to find a green ballpoint ink that really pops. On the positive front, the red color is nice and bright, the black is as dark as I’ve ever seen for a ballpoint and the blue is very much a true blue. 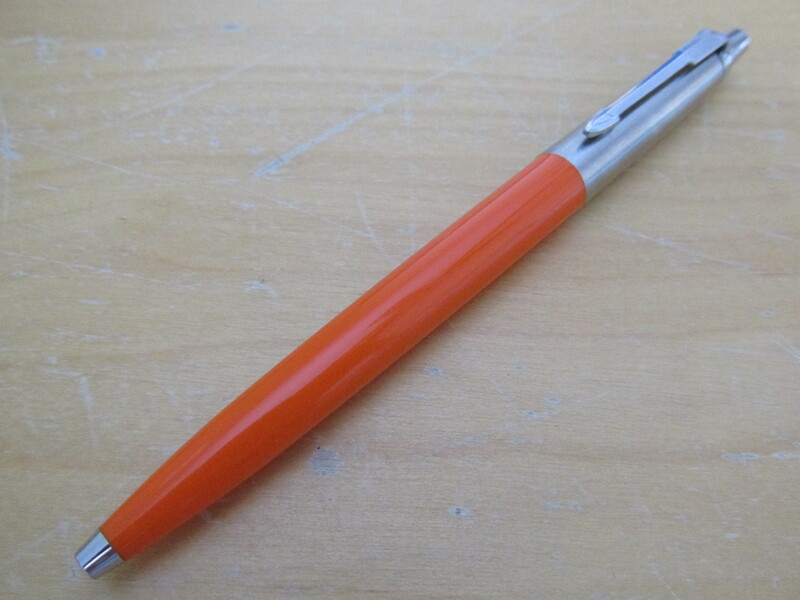 I think I have a broad orange D1 Lamy refill around here somewhere that I might swap into the 2000’s green position. Lastly, the Lamy D1 refills have a small bulge near the tip the refill. This part clearly shows the color of the refill while also making sure the refill fits securely through the tip. A small but clever bit of design. So, there you have it. 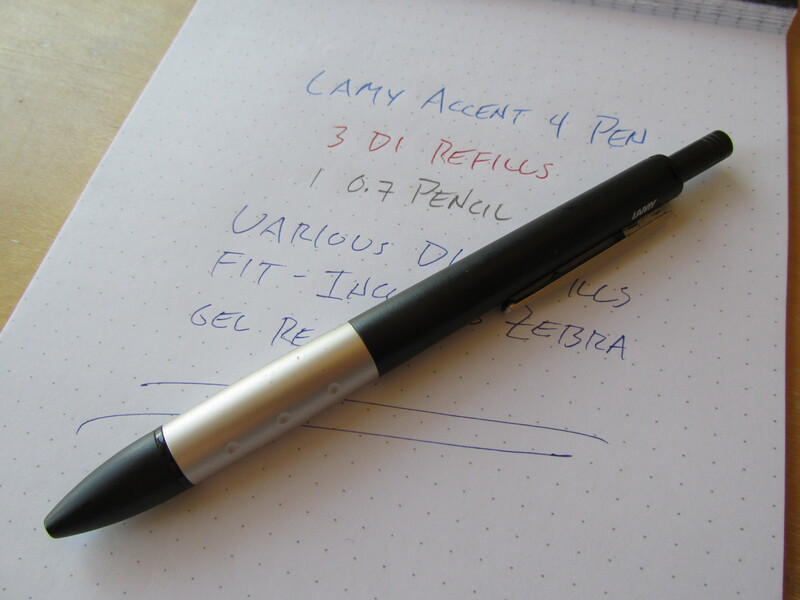 If you ask me (and by coming here, you sort of did), the Lamy 2000 multipen may be the only multipen you need. The design and build are top-notch for a multipen and the Lamy D1 refills, which you are not tied to, are among the best D1 ballpoints I have tried. 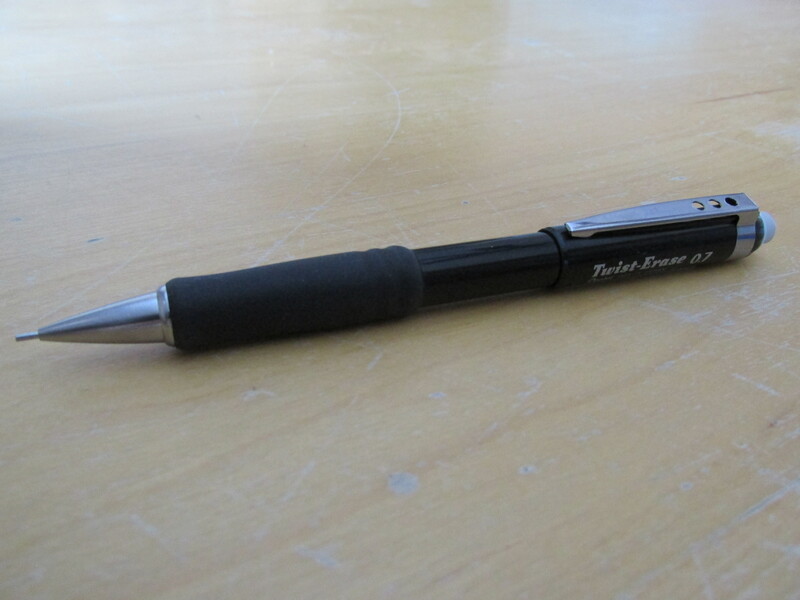 The list price on this pen is around $90 but can be readily had for $75 or less with a bit of shopping around. 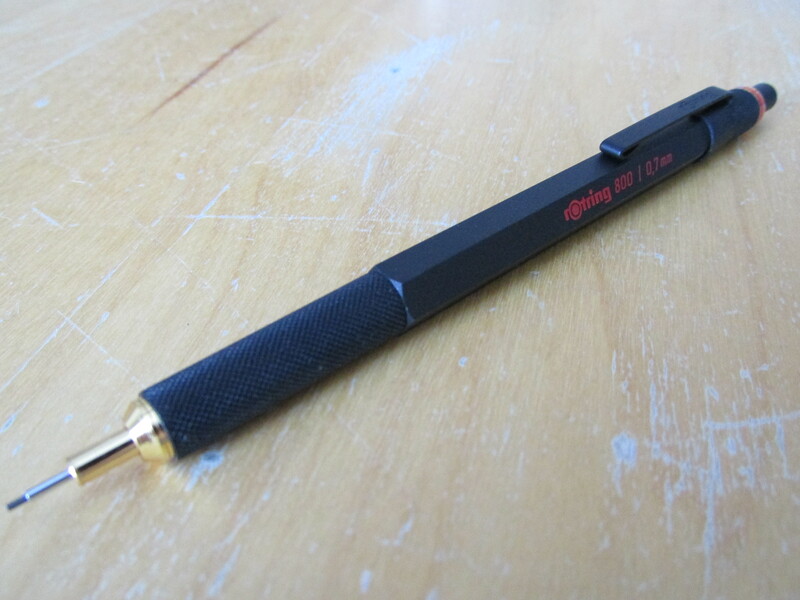 The Lamy 2000 Multipen was recently highlighted in the Pens and Pencils I Actually Use post. (non)Disclaimer: My money…my pen…my thoughts. I’ll be honest. I try hard to put performance at the top of my list, but everything now and then I come across a pen that makes me sacrifice a smidgen of performance because I find its design so compelling. I would put many of the Retro 51 pens in this group. The rollerball refills that come with Retro 51s are finicky for me, but a half-dozen or so of their more compelling designs have made their way into my collection. So too is it with the Caran D’Ache 849. 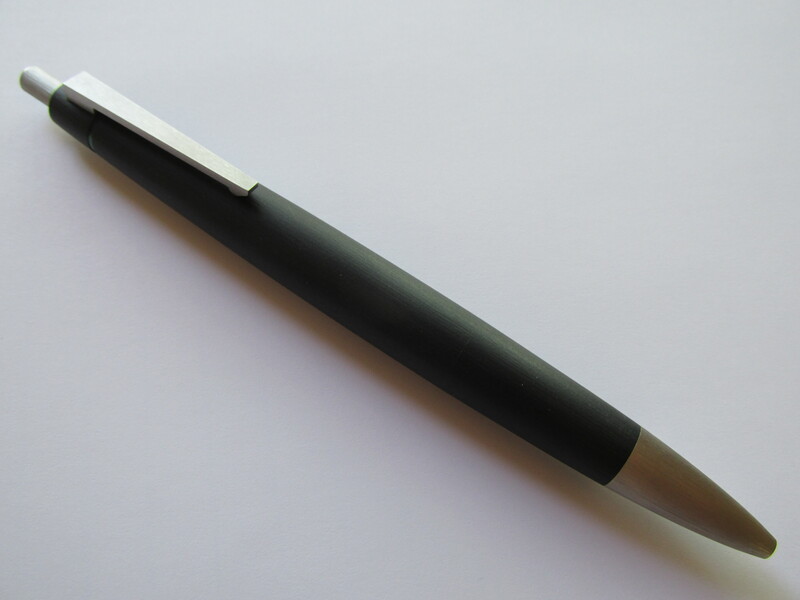 It is not a perfect pen, but its compellingly simple design and variety of finishes makes the 849 a pen I actually use. Let us start from the inside and work our way out. 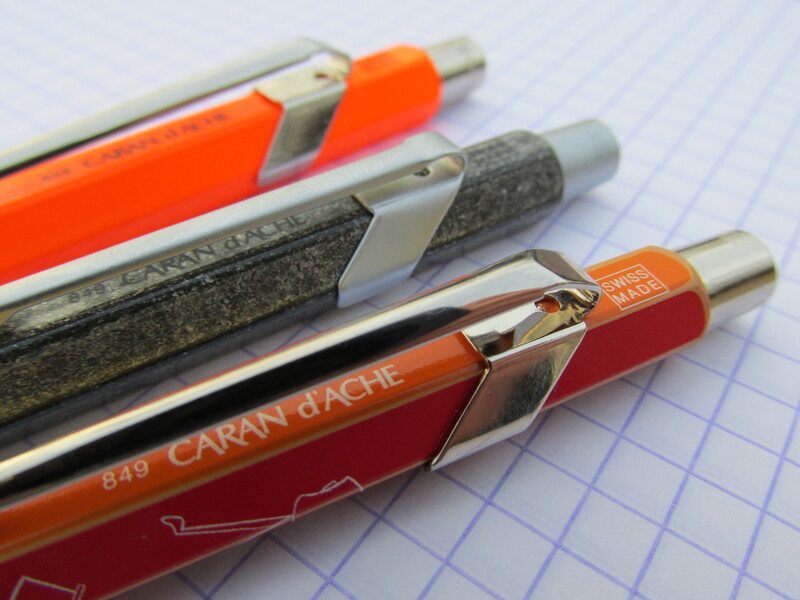 Caran D’Ache makes their own refills for the 849 called the Goliath. 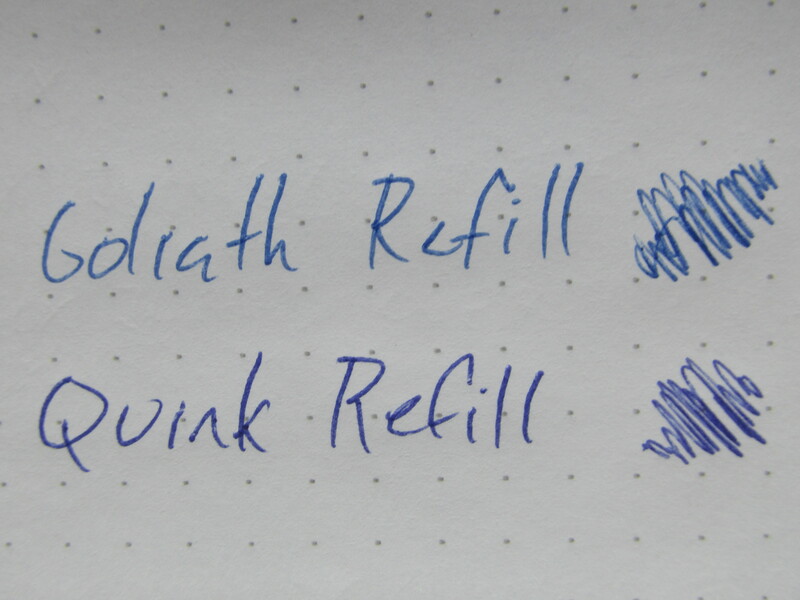 In a side-by-side comparison between the 849 Goliath and Parker Quink refills, the Quink writes a bit more smoothly while the Goliath blue is a more true blue compared to Quink’s purple-blue. Both refills are labelled as a medium point. If the Quink lays down a 1.0 mm line as indicated on the refill, then I would put the Goliath line at about 0.9 mm; it feels thinner even if just barely so. I do like the color of the Goliath blue refill more. I have not done so yet, but I plan to track down a Goliath refill with a broad point. With any luck, the broad point will give me the best of both worlds – a smoother ride and a color I prefer. Stay tuned. You unscrew the clicker or knock or plunger or whatever you call the thing you press to deploy the refill to install same. 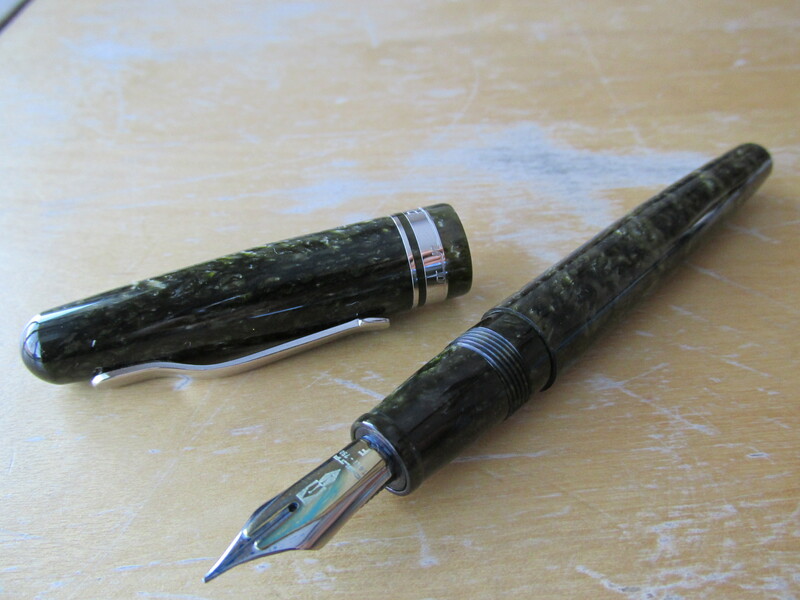 Importantly, the 849 will take any Parker-style refill but there is a small catch – literally. The end of the Goliath refill is flat while the end of the Quink refill has plastic grooves and fins. Both refills are designed to work best with their particular brand so it may take a try or two to get a Quink refill to set adequately and work appropriately with the clicker/knock/plunger/thingamabob of the 849. There can be a bit of a hitch/catch with a less than ideal installation of Parker-style refills. I typically get good results by setting the brass teeth of the clicker into the plastic grooves of the Quink refill, inserting the two pieces while holding the 849 upside down and screwing the clicker assembly until it stops. I have also found that good action of a Parker-style refill can come down to the spring. 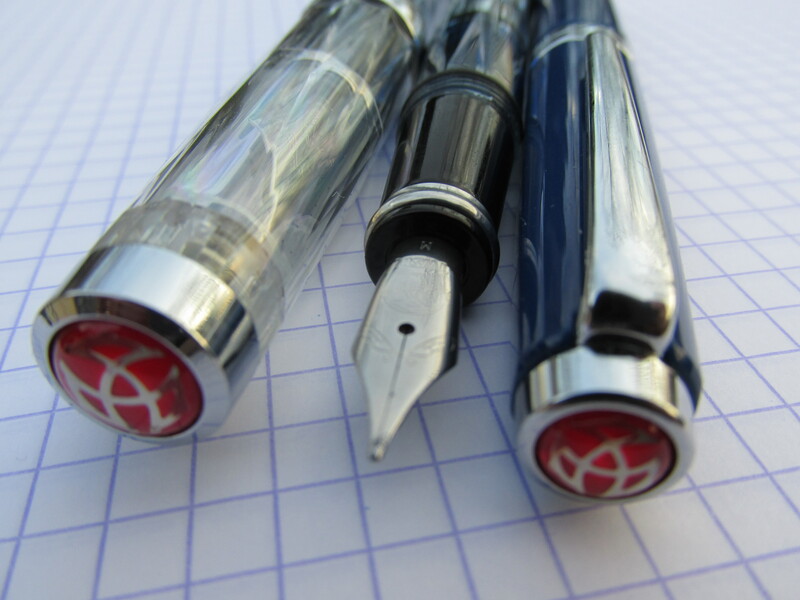 If you have a spring that works well in a Parker Jotter, try installing it in a 849 when using Parker-style refills. Ultimately, I find the click action of the 849 with Parker and Goliath refills to be indistinguishable. 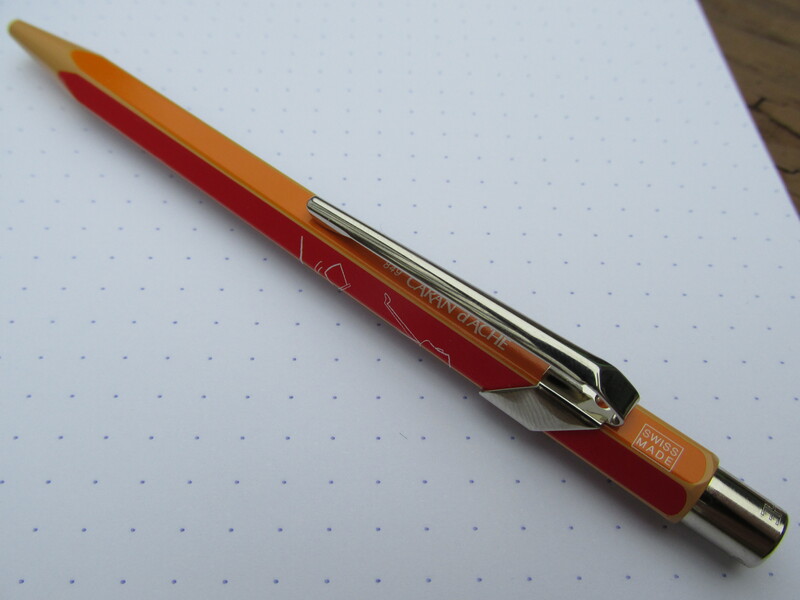 Compared to the tight “snap” of a Parker Jotter knock, the 849 click is softer. Deploying an 849 may not feel and sound as satisfying as the crack of a Jotter, but it also won’t annoy the heck out of co-workers as you play with your pen during an endless meeting. As you have read so far, the 849 experience is not perfect but now we get to the good stuff. The look and feel of the 849 is fantastic. The three 849s I have are among my favorite looking pens in the collection. The orange color on the one 849 may be the most orange thing in my entire house and the black labelling on the pen just pops off. The grey 849, technically called the 849 Original, has a very cool marble finish. 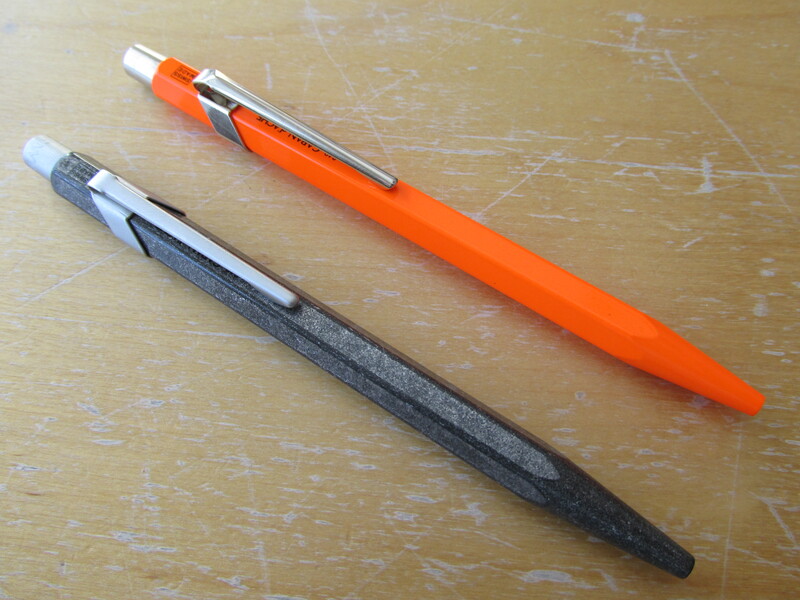 The knock and clip of the Original are a matte grey color that compliments the pen body perfectly. Lastly, the multiple colors of the Caran D’Ache 100th Anniversary 849, along with its pencil-like design, makes it the most unique looking pen I own. The metal material and hexagonal shape give all the 849s heft and control that fits my hand nicely. 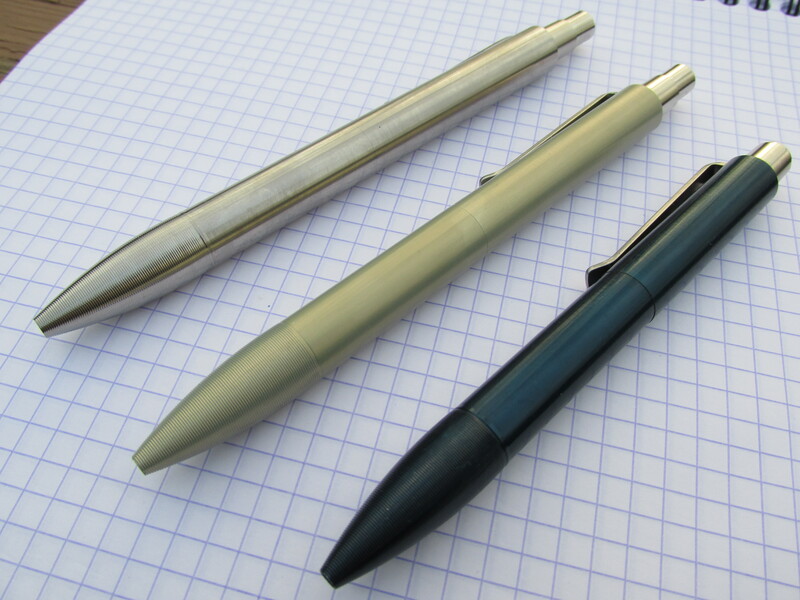 Again, comparing the 849 to a Parker Jotter, the metal 849s are just a touch heavier in the hand and about 3 mm shorter than an older Jotter (the ones with brass threads). Starting at just under $20, standard issue 849s come in a rainbow of colors (matte, metallic, fluorescent). The 849 Original and the 100th Anniversary edition will run you about $10 and $25 more, respectively. I’ll freely admit there are better writing pens out there. After all, the 849s are just a ballpoint (some people consider that an insult – I don’t). That said, factor in the all metal construction, the cool design varieties and the flexibility of refill options, and the Caran D’Ache 849 scratches the same collecting itch and user experience as pens like the Parker Jotter and the Retro 51. In short, it works for me. 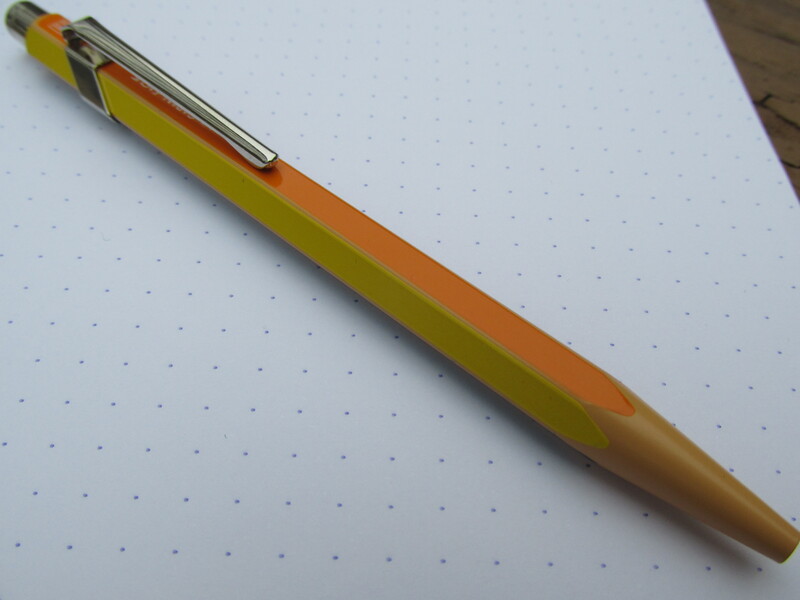 Is it an overstatement to suggest that the Parker Jotter is the most important writing implement of the 20th century? I don’t think so. 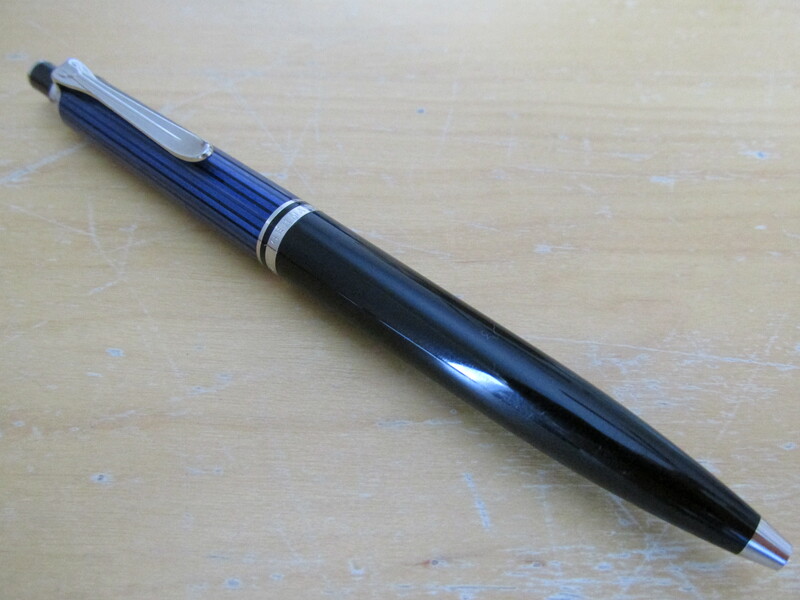 While it was not the first ballpoint pen widely available to the buying public, it was the first ballpoint that was both reliable and affordable. Introduced in 1954, the Jotter original cost $2.50 (about $24 in 2014 dollars). Considering that a standard, well-built Jotter can be had for less $10 and that various “deluxe” versions with upgraded materials go for about $20, the Jotter remains a solid buy. 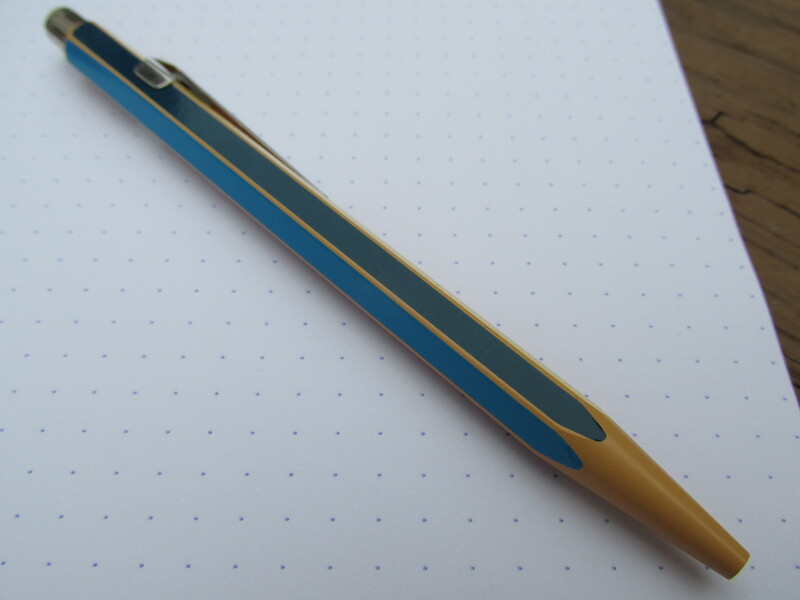 The Parker Jotter is on any short list of iconic pen designs. While its basic shape has not changed in 60 years, there have been a handful of modifications over the years. The clip and plunger have gone through a few iterations and the body comes in more colors and designs than you can easily count. Early on, the clip got its arrow shape and the engraved feathers have come and gone and the plunger has been rounded, flattened and rounded again. These small tweaks are nice and all, but for me, the fun of collecting Jotters is all about the colors and designs. But why would anyone need more than one Jotter? 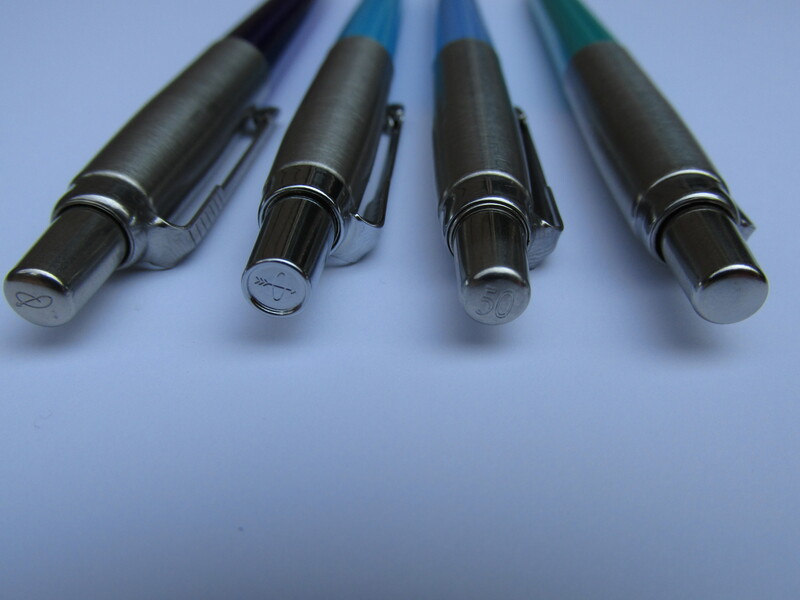 Well, for a small investment, you can get a consistent writing experience in a variety of colors and designs to suit any situation or mood at work, school or home. 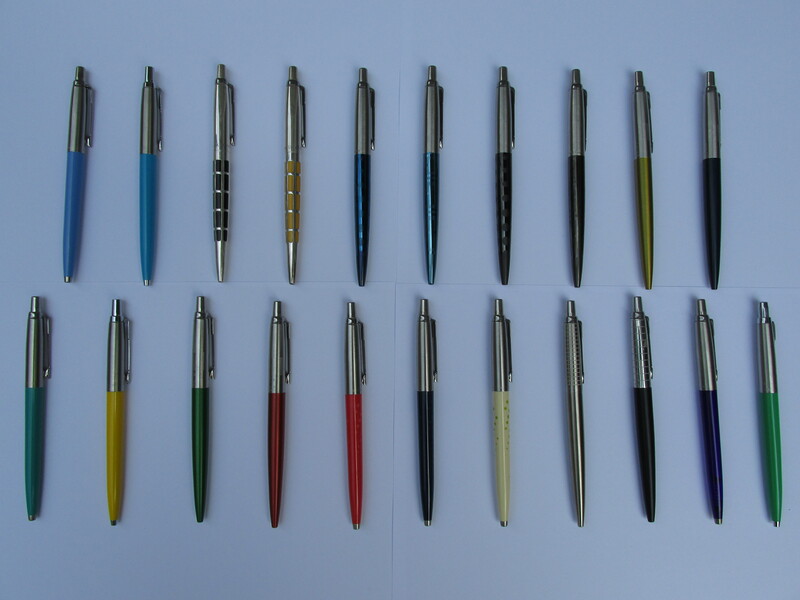 Of course, the same can be said for other widely-available pen designs such as Retro 51 or the Fisher Space Pen. The build quality of the Jotter is solid. Of the 20 plus Jotters I’ve owned during 20 plus years, I’ve never had a hint of an issue with the body or clip sections. I have lost the tiny spring that sits inside the tip of the body, so you’ll want to take care not to loss the spring when replacing the refill. The spring usually stays inside the pen when changing refills, but every now and then it will get stuck on the end of the refill and you may lose it if you’re not paying attention. 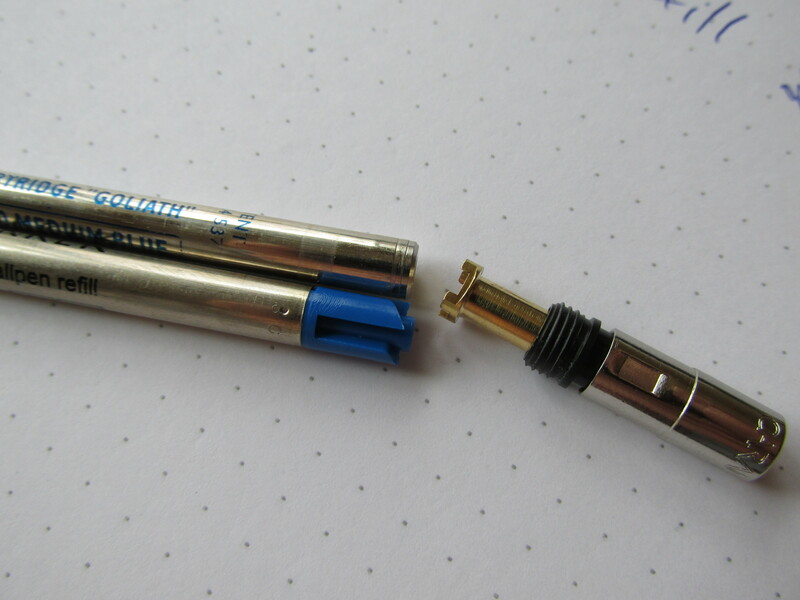 One minor, yet noticeable, alteration done to the Jotter sometime in the 1980s was swapping the brass threads for plastic threads inside the cap section. It’s not a huge difference, but I do like the extra bit of weight the brass threads provide. There are literally dozens upon dozens of refills made by a variety of manufacturers. So, while we’re not talking fountain-pen-range-of-options here, surely you can find at least one refill that works for your typical needs. Personally, I’m partial to the newer Quink refills made by Parker and Fisher Space Pen refills. Other folks swear by the EasyFlow 9000 from Schmidt or the various gel refills made by Monteverde, which brings me to a quick bit of advice. If you audition an older Jotter, look inside the pen first. If it has an older Parker refill then do not give the writing experience any credence. Instead, focus on the design and condition of the pen itself and know that you’ll be able to get a solid writing experience with a new refill. It’s an icon. It’s well built. It accommodates a variety of refill options. Put it all together and the inevitable conclusion is that you should get a Jotter (or two or three) and spend a bit of time and money finding a preferred refill. Personally, I prefer the metal Jotters to the plastic ones. Unless it’s an older Jotter with the brass threads, I find the plastic versions to be too light; I would rather write with the added heft of the all-metal editions. Once you find a workable combination, keep the pen handy and I suspect you’ll find yourself reaching for the Jotter more often than you might have thought.